Moxibustion is the burning of a dried herb called moxa (usually mugwort or Artemisia vulgaris) to treat disorders. Moxibustion, along with acupuncture and herbs have been used for a very long time. Moxa provides a penetrating heat that can enter the channels to influence Qi and blood flow. Moxa may be administered in several different ways. One method is to burn it in the form of a stick that is held about two centimeters above a specific point. The patient usually experiences a pleasant warming sensation. 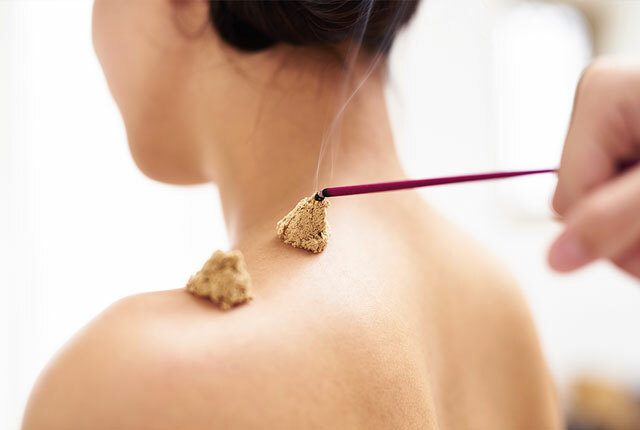 Another method for administering moxa is to burn it at the end of an acupuncture needle that is inserted in a specific point. Studies indicate moxibustion is helpful in the treatment of breech babies, gastrointestinal disorders, headaches, colds and flu and general immune boosting, and labour induction to name a few uses. On your next visit to the clinic, ask us for instructions how to light, use and extinguish the moxa sticks at home. Total Wellness Centre has found and reviewed relevant scientific studies on the treatment of breech babies and other issues during pregnancy with acupuncture, moxibustion and traditional Chinese medicine. Please review the most up to date worldwide research on our website.